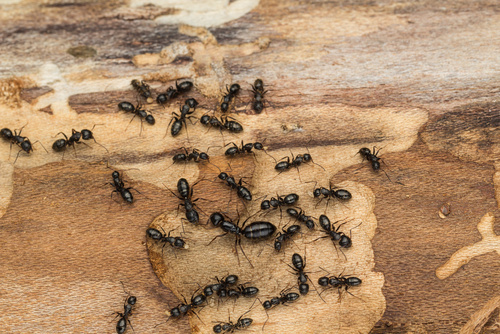 Tiny, numerous, and extremely invasive, ants can enter through the tiniest cracks and cause big problems in your home or business. If you spot one ant, you can be sure that more will follow because they leave an invisible chemical trail that leads colony members to food sources. Do-it-yourself approaches to eradicating an infestation tend to only kill the ants you see. Unless you have a professional address the infestation, you will likely see more in the future. Buckmaster Pest Control has the needed industry knowledge and experience to eliminate existing ants, address points of entry, and deliver treatment that penetrates and destroys unseen nests hidden in your walls or foundation to prevent future infestations. Entry – they enter through the tiniest cracks to seek out water, food, and nesting. Scent trails – they leave an invisible chemical trail for colony members to follow to food sources. Nests – they can nest nearly anywhere in or around your home: lawns, stumps, walls, foundations. Colony size – they can number in the hundreds of thousands and relocate whole colonies quickly when threatened. Life cycle – their four life stages (egg, larvae, pupae, adult) take several weeks to several months for complete metamorphosis, depending upon the species. Why not DYI? – different types of infestations require different treatments and most DYI approaches kill only the ants you see.